Heat-shock protein 60 (Hsp60) has been shown to provoke inflammation, and anti-Hsp60 may facilitate the development of atherosclerosis. In this study, we have investigated 30 patients with mixed connective tissue disease (MCTD) and assessed anti-Hsp60 and their relationship to cardiovascular diseases (CVD). Out of 30 patients with MCTD, 15 had CVDs. 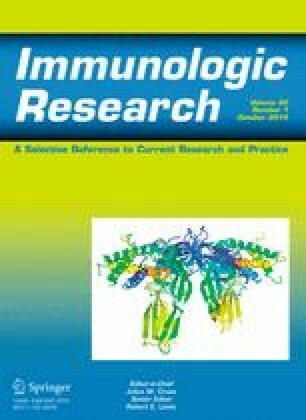 Anti-Hsp60 antibody was determined by enzyme-linked immunosorbent assay. Since endothelial dysfunction and accelerated atherosclerosis are characteristic to MCTD, a wide array of MCTD-, endothelial dysfunction- and CVD-associated parameters was investigated: serum lipid levels, paraoxonase activity (PON1), rich nuclear ribonucleoprotein U1 (anti-U1RNP), anti-endothelial cell antibodies, anti-cardiolipin and anti-β2-glycoprotein I antibody isotypes (anti-CL and anti-β2GPI), endothelin-1 (ET-1) levels, also intima–media thickness (IMT), a quantitative indicator of atherosclerosis. In MCTD, anti-Hsp60 antibody levels were significantly higher than in healthy individuals (p < 0.02). MCTD patients with CVD had significantly higher levels of anti-Hsp60 compared to MCTD without CVD (p = 0.001). Patients with MCTD had significantly lower high-density lipoprotein cholesterol (p = 0.02) and PON activity (p < 0.001), and significantly increased systolic (p < 0.0002) and diastolic (p < 0.001) blood pressure compared to healthy individuals. Anti-U1RNP levels (p < 0.002) and IMT were higher in patients compared to controls (p = 0.002). The CVD-positive MCTD patients had increased anti-Hsp60 (p < 0.0013), anti-CL IgG (p = 0.0005), ET-1 serum concentration (p < 0.05) and IMT levels (p < 0.001) compared to MCTD patients without CVD. Anti-Hsp60 showed a strong correlation with anti-oxLDL (r = 0.36, p = 0.01) and serum ET-1 (r = 0.62, p < 0.001) and negative correlation with PON activity (r = −0.47, p = 0.01). Anti-Hsp60 indicates endothelial injury, CVD, and can function as a novel atherosclerotic risk factor, also a valuable diagnostic marker in patients with MCTD.